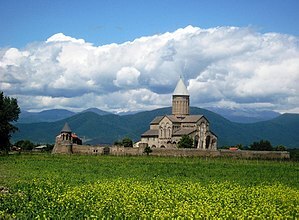 Kakheti (Georgian: კახეთი [kʼɑxɛtʰi]) is a region (mkhare) formed in the 1990s in eastern Georgia from the historical province of Kakheti and the small, mountainous province of Tusheti. Telavi is its capital. The region comprises eight administrative districts: Telavi, Gurjaani, Qvareli, Sagarejo, Dedoplistsqaro, Signagi, Lagodekhi and Akhmeta. Kakheti is bordered by the Russian Federation (Dagestan and Chechnya) to the Northeast, Azerbaijan to the Southeast, and Mtskheta-Mtianeti and Kvemo Kartli to the west. Kakheti has a strong linguistic and cultural identity, since its ethnographic subgroup of Kakhetians speak Kakhetian dialect. The Georgian David Gareja monastery complex is partially located in this province and is subject to a border dispute between Georgian and Azerbaijani authorities. Kakheti is a popular destination in Georgia, the main tourist spots are Tusheti, Gremi, Signagi, Kvetra, Bodbe, Lagodekhi Protected Areas and Alaverdi Monastery. The region produces wines in micro-regions of Telavi and Kvareli. Beyond the modern-day administrative subdivision into the districts, Kakheti has traditionally been subdivided into four parts: Inner Kakheti (შიდა კახეთი, Shida Kakheti) to the east of Tsiv-Gombori mountain range, along the right bank of the Alazani River; Outer Kakheti (გარე კახეთი, Gare Kakheti) along the middle Iori River basin; Kiziq'i (ქიზიყი) between the Alazani and the Iori; Thither Area (გაღმა მხარი, Gaghma Mkhari) on the left bank of the Alazani. It also includes the medieval region of Hereti whose name has fallen into gradual oblivion since the 15th century. Kakheti was an independent principality from the end of the eighth century. It was incorporated into the united Georgian Kingdom at the beginning of the eleventh century, but for less than a decade. Only in the beginning of the twelfth century did Georgian King David the Builder (c.1089–1125) incorporate Kakheti into his Kingdom successfully. After the disintegration of the Georgian Kingdom, Kakheti became an independent Kingdom in the 1460s. From the early 16th century till the early 19th century, Kakheti and its neighboring Kartli came under intermittent Iranian rule. In 1616, Shah Abbas deported hundreds of thousands of the ethnic Kakheti Georgian population to Iran and destroyed the region during his punitive campaign against Teimuraz I, his formerly most loyal subject. During all these centuries the region was an integral part of Iran and it supplied many notable generals, administrators, women and many hundred of thousands of peasants for the Iranian overlords. In 1762, the Kakhetian Kingdom was united with the neighboring Georgian Kingdom of Kartli into the Kingdom of Kartli-Kakheti under King Heraclius II. Following the Treaty of Georgievsk and the sack of Tblisi by Agha Mohammad Khan, in 1801 the Kingdom of Kartli-Kakheti was annexed to the Russian Empire. Russian suzerainty over Kakheti and the rest of Georgia was recognized by Qajar Iran in the 1813 Treaty of Gulistan. In 1918–1921 Kakheti was part of the independent Democratic Republic of Georgia, in 1922–1936 part of the Transcaucasian SFSR and in 1936–1991 part of the Georgian SSR. 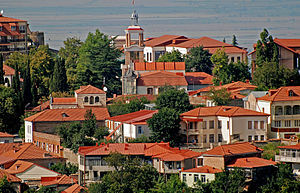 Since the Georgian independence in 1991, Kakheti has been a region of the republic of Georgia. Telavi is still its capital. ^ Michael Mainville (2007-05-03). "Ancient monastery starts modern-day feud in Caucasus". Middle East Times. Archived from the original on 2007-09-29. Retrieved 2007-06-23. Wikimedia Commons has media related to Kakheti.